Twitter is beta testing a new service. Pay $99 per month and have all your Tweets automatically promoted. I gave it a try; in this blog I share my experience and data after using it for one week. I have just over 7 000 followers on Twitter. The account is nine years old and I have written over 45 000 Tweets. Not an average account, not exceptional one either. While I started to tweet in German, I switched to English in 2011. The account is verified. I have played with Twitter Ads in the past, but not intensively. My account is mostly personal. 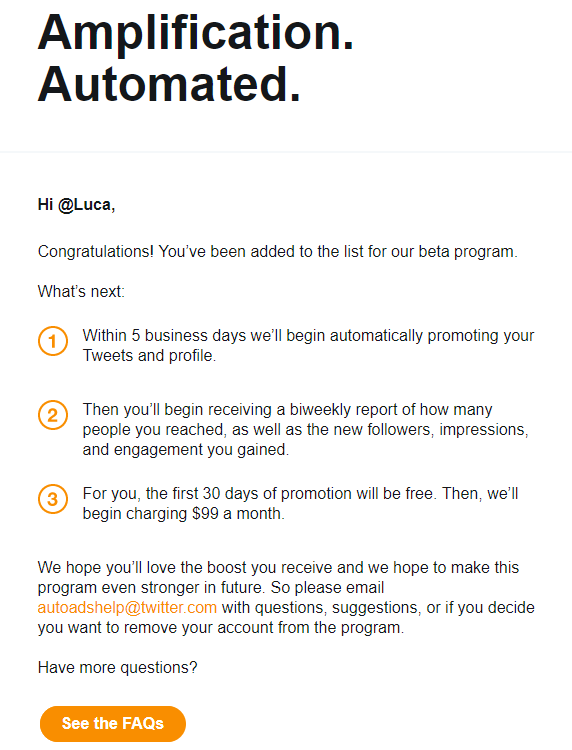 On July 28th, I got an email from Twitter, offering me a seat in the private beta of #AutoAds. There was a second email with similar content three days later. I finally signed up. The first month is free and I wanted to know how well the program works. 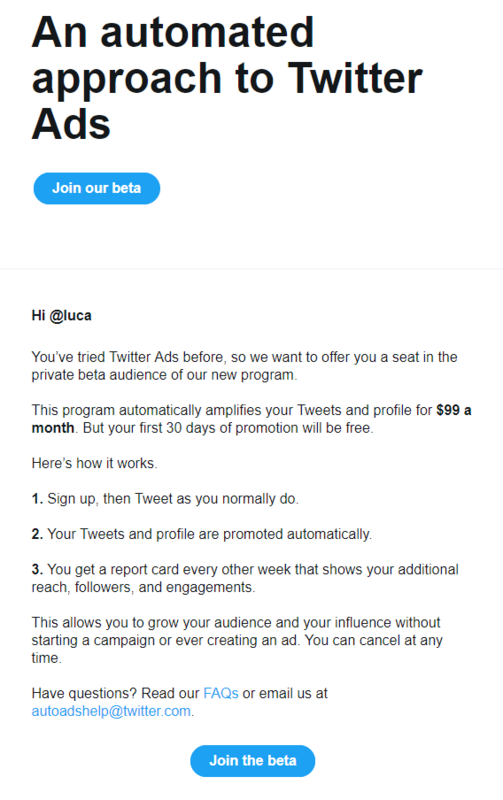 I always wanted a Twitter Premium Program to become a reality, as it is my favorite social network. I thought to pay up to $10 per month would be ok. $99 is too expensive for a personal account, but if it works well, it could be a good choice for companies and freelancers. 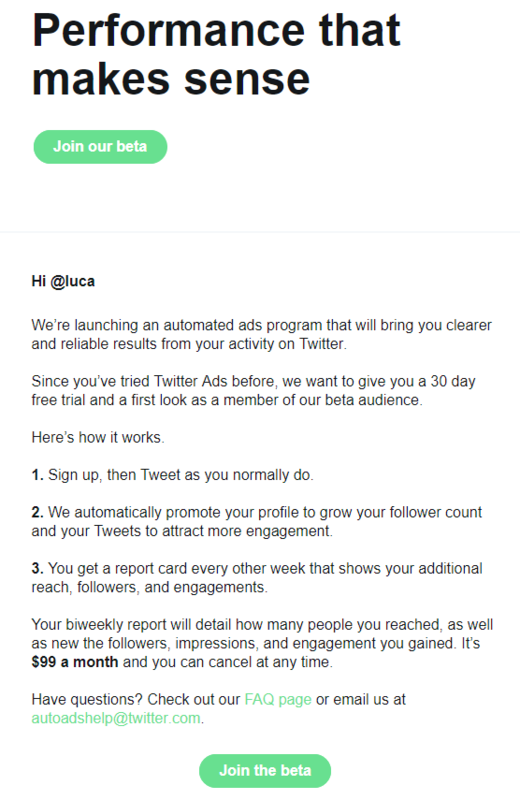 After signing up I got an email that Tweets will be promoted within 5 business days. One week and five business days later, my first Tweets got automatically promoted. Instead of optimizing campaigns, you just keep tweeting and focus on better content. The Tweets will be automatically promoted and theoretically help you reach more people and gain new followers. I will come back to how well it worked in practice in the next section. In July, I wrote 489 Tweet and got 780 000 impressions. I was skeptical if automated promotions could have a real impact on this. $99 per month divided by up to 10 Tweet per day results in a budget of a little over 30 Cents per Tweet. In the 9 days since AutoAds got enabled on my account, I published 80 Tweets. 56 of them got automatically promoted. The Tweets got 132263 organic impressions and 5300 organic engagements. Through the promotion, the Tweets got an additional 8 921 impressions (7%) which is okay but not that impressive. But they also got 2 381 additional engagements (45%). That had me very impressed. $99 for the full month, about $10 for the 9 days. 4 Cent per engagement, if you don’t care about impressions. 1 Cent per impression if you don’t care about engagement. Only 38 of the 58 promoted Tweets got any engagement. Average 63 engagements, median 7. This indicates that the promotion of Tweets that aren’t engaging is stopped early. This graph shows my promoted Tweets sorted by promoted impressions. To get significantly promoted, Tweets need to have a promoted engagement rate above 15%. Only two Tweets had a lower rate (7 and 8%) and got at least 200 Promoted Impressions. While promoted performance per Tweet varies a lot, comparing days shows 5-10% additional impressions on most days. Additional engagements of 20-80%. In absolute numbers: 300 – 1,600 additional impressions and 30 – 500 additional engagements. For me, it doesn’t matter which Tweet gets the impressions or engagements. If you are a company, getting more impressions and engagement on random Tweets may not make you happy. If you want to see a direct ROI, automated ads won’t make you happy. If you are interested in branding, they are quite interesting. Especially if the available targeting fits your needs. My most successful Tweet (12 195 organic impressions) was at the same time my most successful promoted Tweet (1 099 Promoted Impressions). Engagement-wise a low-quality tweet got the most promoted engagements (470). 81 organic engagements bring it to 13th place. 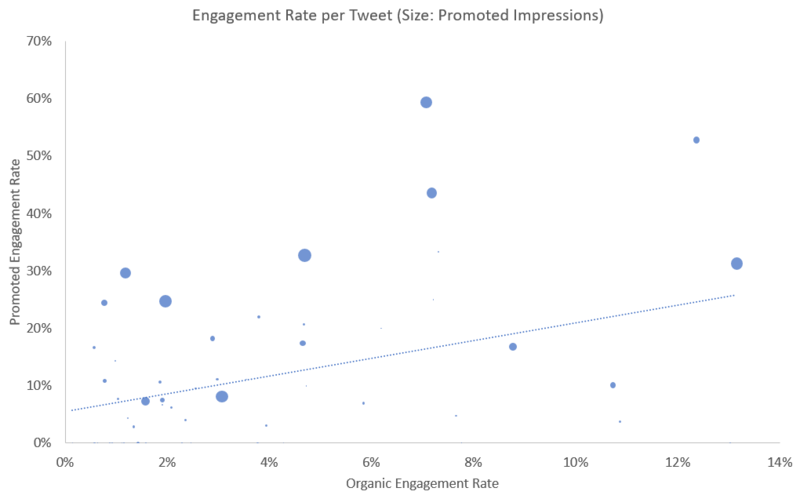 Not all Tweets with a high Organic Engagement Rate have a high promoted engagement rate. I assume that only the promoted engagement rate is taken into account to decide if a Tweet is promoted more or not. Who sees the Promoted Tweets? The targeting options are very limited. Either by location or by interest. At the moment it is not possible to combine both. I assume that this broad targeting makes it possible to make the ads so cheap because they can be served to people who aren’t targeted by normal ads. Twitter can make an efficient use of its whole inventory. Books and literature; Movies and television; Music and radio; Gaming; Automotive; Business; Careers; Life stages; Education; Family and parenting; Events; Food and drink; Hobbies and interests; Home and garden; Law, government, and politics; Personal finance; Society; Science; Pets; Sports; Beauty; Style and fashion; Technology and computing; Travel; Health. Albuquerque-Santa Fe NM, US; Atlanta GA, US; Austin TX, US; Baltimore MD, US; Birmingham AL, US; Boston MA-Manchester NH, US; Charlotte NC, US; Chicago IL, US; Cincinnati OH, US; Cleveland-Akron OH, US; Columbus OH, US; Dallas-Fort Worth TX, US; Denver CO, US; Detroit MI, US; Grand Rapids-Kalamazoo-Battle Creek MI, US; Greensboro-High Point-Winston Salem NC, US; Greenville-Spartanburg SC-Asheville NC-Anderson SC, US; Harrisburg-Lancaster-Lebanon-York PA, US; Hartford & New Haven CT, US; Houston TX, US; Indianapolis IN, US; Jacksonville FL, US; Kansas City MO, US; Las Vegas NV, US; Los Angeles CA, US; Louisville KY, US; Memphis TN, US; Miami-Fort Lauderdale FL, US; Milwaukee WI, US; Minneapolis-St. Paul MN, US; Nashville TN, US; New York NY, US; Norfolk-Portsmouth-Newport News VA, US; Oklahoma City OK, US; Orlando-Daytona Beach-Melbourne FL, US; Philadelphia PA, US; Phoenix AZ, US; Pittsburgh PA, US; Portland OR, US; Raleigh-Durham NC, US; Sacramento-Stockton-Modesto CA, US; Salt Lake City UT, US; San Antonio TX, US; San Diego CA, US; San Francisco-Oakland-San Jose CA, US; Seattle-Tacoma WA, US; St. Louis MO, US; Tampa-St. Petersburg FL, US; Washington DC, US; West Palm Beach-Fort Pierce FL, US. I don’t have a very specific target audience for my account. English speaking Europeans would fit best. But that isn’t available. I would have chosen Europe or SW-A-G (Switzerland, Austria, German) if it was available. Because it wasn’t, I took ‘Science’ with the assumption that my data visualizations would be best received by there. I believe humans are more complex than the targeting options by any ad provider and often the platforms get the categorization wrong. I did a little test to see if the categorization by Twitter fits the self-categorization of the users. A simple Twitter poll. „If you see this as a promoted tweet: Are you interested in science?“. Available answers: „Not a promoted tweet“, „Interested in science“, „Not interested in science“. I assume most people would categorize themselves as interested in science, for targeting this should be enough. The first time the Tweet didn’t get promoted. This happened in other cases as well. Tweets that were within my first ten Tweets of the day and neither a Reply, Quote nor a Retweet. I haven’t found a pattern yet, why some Tweets aren’t promoted. The result of that Tweet showed that 25% of the people who answered it, didn’t read/follow the question. It got 57 answers. The second time it got promoted and received over 360 votes. 20% (72) said they saw it as an organic Tweet. Of the other 80%, 220 (76%) said they are interested in science and 68 (24%) they are not interested in science. If you see this as a promoted tweet: Are you interested in science? I did a similar test to see if I can reach people outside of the USA with automatically promoted Tweets. Because Twitter recognizes the language of Tweets, I was hoping that it would promote Tweets according to their language. It doesn’t seem so. I asked where people are from if they see the Tweet as a promoted Tweet. Once in English and twice in German, because the first German one wasn’t promoted. Votes on both promoted Tweets showed that the majority of the audience comes from the USA. Replies to the German one wondered why it was promoted and stated that they don’t understand the question. If you see this as a promoted tweet: Where are you from? I asked some of my followers if they saw any of my Tweets promoted, they didn’t. On Facebook, many marketers say that you have to promote your posts to have significant reach. On Twitter, most of the timeline is still chronological. But there are several blocks of old Tweets in the timeline. “While you were away” and similar blocks that show older Tweets that Twitter thinks are interesting to the user. Each of these blocks pushes organic Tweets further down and depending on the usage of people forever out of sight. But automatically promoted Tweets don’t have the primary goal to reach your existing audience but grow your audience. If you wanted to reach your existing audience a targeted campaign for your followers would work better than the broad targeting of AutoAds. Will AutoAds change how people perceive Ads? Automatically promoted Tweets make ads sound organic, because they are organic Tweets. Instead of highly optimized brand messages, normal Tweets as mundane as they can be will be in the place of ads and are marked as ads. People learn to skip ads quickly because of the way they look and are worded. If automated ads break through this filter, it could make people slower at skipping ads and have an impact on how well other ads perform. But it’s way to early to know if there will be any effect. Twitter AutoAds solve multiple problems. Creating ad campaigns takes time, is complicated and not fun for most people. AutoAds make it easy and fast. Every Tweet is a potential ad. The better the Tweet performs, the more it gets promoted. People prefer good ads. Content creators spend more time creating, and less promoting. Each view on a timeline is part of the inventory Twitter tries to sell. In most cases marketers are after narrow target groups. Often because they perform best. The best performing groups are targeted the most. Adaptive costs make sure that clicks by the most sought after groups are more expensive. There are many accounts that make Twitter no or little money because they aren’t targeted. Inventory Twitter can’t sell. With AutoAds, Twitter can sell unused inventory for cheap. Even as a flat rate. For companies that spend money on creating content for their social media platforms, a fee of $99 per month is cheap. Especially for 10% more impressions and 50% more engagements. The fee makes sure that even accidentally awesome Tweets get promoted accordingly. Right now the biggest caveat are the targeting options. If they fit, I recommend giving it a try. Studied communication and media scienece. Blogging since 2006. Working on blognetz.com, exploring new tools to communicate and helping other people to use them.